The movie is set to star Eva Longoria, Isabela Moner, Michael Peña and more. The trailer just dropped on Saturday and it looks like it’s going to be quite a ride! Dora, from the Nickelodeon TV show "Dora the Explorer," is still rocking her pink T-shirt, orange shorts and classic bob and bangs ‘do. This time, though, she’s all grown up and on a big adventure in the jungle and in high school. The movie is set to star Isabela Moner as Dora with Eva Longoria and Michael Peña as her parents and Jeffrey Wahlberg as her cousin Diego. 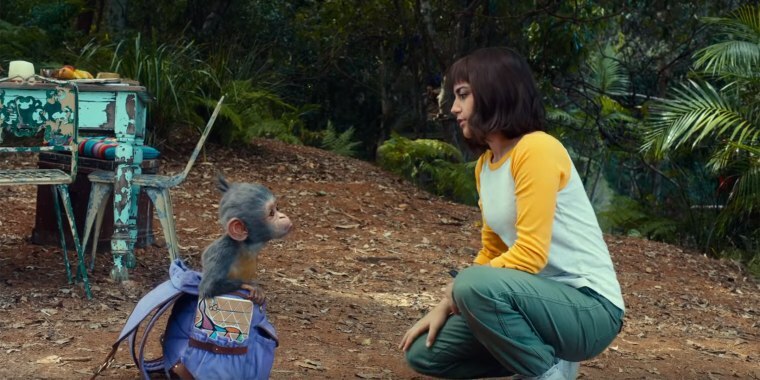 The movie follows Dora’s transition from the jungle into an even bigger feat ... high school. After her parents set out to find the lost city of gold as their latest adventure, Dora is sent to the city to stay with her family, including her cousin Diego. Things go wrong pretty fast and Dora, Diego and their classmates find themselves in trouble on a school field trip to the museum. During a scavenger hunt assignment around the museum, she and her classmates are kidnapped by criminals to help them find the same lost city of gold that her parents are hunting for. Dora heads back to the jungle with her cousin and classmates on an adventure in an effort to save her parents and discover the lost city once and for all. "Dora the Explorer," joins the long list of childhood classics coming back for fans to enjoy. The movie hits theaters on August 2, a perfect summer hit for families!